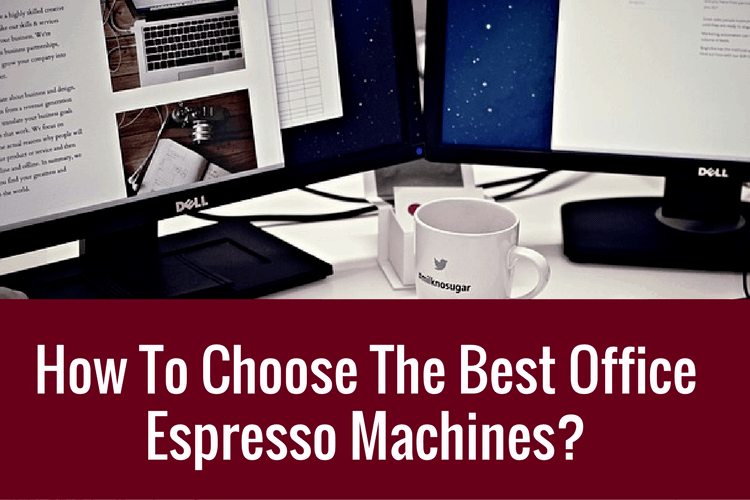 [GUIDE 2019] How To Choose The Best Office Espresso Machines? How To Choose The Best Office Espresso Machine? A happy employee is an effective employee. Agree? Nowadays, provision of an espresso machine for the employees in an office is a very common practice, used by employers in order to keep the team happy and more focused by avoiding the frequent outside visits for coffee breaks. Want more ideas on how to motivate your employees? Check this out. But do you know how to choose one? When selecting one for your office, there are some factors that need to be considered before making a purchase. As various models can come with different strengths, it is vital to filter out only those that are suitable in an office setting. First and foremost, we strongly recommend an automatic machine. Why? Consider what are you trying to replace? You are trying to keep them happy by providing (free) great coffee with convenience. Essentially, you are trying to replace that coffee shop down the street. This translates to having a machine that is easy to use, offers a variety of brews, fast and can cater to many people at any one point in time. Think back to the small pantry at the corner. The last thing you want is a beeline forming there. Simply by adding the coffee beans and pressing the button, you get great coffee and great productive, happy employees. Office espresso machines must be able to produce large volumes of drinks as compared to the small and home-based espresso machines. Normally, an espresso machine for office should be able to make more than 50 drinks per day. As mentioned earlier, you want to be able to have an office barista. Most super-automatics have one-touch system that simplifies the whole process. One just needed to choose what they want and then just press the start button. If you like a different flavor, simply select the on-screen option, like coffee with milk, just select the on-screen milk option. High capacity espresso machines are not cheap. So you will have to be able to prolong the useful life. You do not want the accounting team or the boss to come after you. Or if you are the boss, you would want to keep to the budget to ensure profitability. It is recommended to buy a machine that comes in metal structure as it will last longer as compared to the plastic body machines. It looks sleek too. Advanced features such as flavor selection, milk options, coffee strength, temperature adjustments gives everyone a choice in what they like best. Moreover, these machines offer customization facility with a user-friendly interface and touchscreen display. Aside, some machines allows additional flavors such as vanilla, hot chocolate or even just the warm water for tea lovers. While most offices do have hygiene staff, you wouldn’t want to make things difficult for them too. This is where the cleaning and maintenance of the machine comes in. Usually, it should take you around half and hour to clean the machine. Moreover, super automatic espresso machines contain a larger number of components and do require extra care, maintenance and repairs. Thankfully, the process is made simpler as most models that are available in the market offer hot water rinsing cycle, after making every cup or after some cups of coffee. This process keeps the internal milk and coffee tubes clean at all times. In addition, a decent office espresso machines mostly comes with external removable water tank, milk container and frother, which makes it easy to disassemble and clean the machin more thoroughly. Due to their extensive daily use in an office environment, it is recommended to clean the entire coffee machine everyday at the end of the day to avoid health and safety issues. Employees can control and adjust the temperatures as per their requirements. Also, the machine offers the facility to adjust the volume and strength of the drink. ​Some high quality and heavy machines for offices comes with double boilers in order to keep the operation running smoothly with consistent quality. Moreover, the double boilers facility reduces the time a machine normally takes to prepare milk-based drink. High-end machines for offices come with dual steam wands which allow making multiple drinks at a time. By plumbing the water tank and waste line you can enjoy hassle-free smooth operations as it won’t require water tank filling at all times. Keep the coffee cups warm and prevents seeping the heat out of it, you can enjoy a hot and warm cup of coffee anytime. To help you better. We have also provided detailed analysis below on different machines that will help you in selecting a machine for your offices. Jura Impressa XS90 is an excellent Swiss-made machine for office use. With elegant design and features, it not only looks great but also makes the operation really simple. The machine also has an Energy Safe Mode (ESM), which allows the machine to use 60% less energy. Customize and programmable feature allow adjusting the strengths and quantity as per users’ desire. This machine can prepare two cups of espresso with just one brewing operation, also provides an active bean monitoring. High-performance pump that provides 15 bars of pressure ensures rich and smooth coffee. The maintenance status displays the cleaning and filter status, also the number of drinks dispensed. This is helpful to deciding when it is time for a clean. In addition, it has a very sound design which makes the machine extremely quiet. More built-in functions include the water filter display, automatic milk rinse, and time display. The Breville BES980XL Oracle is another good machine that can be used in an office environment. Designed for moderate-heavy use, this machine also comes with a built-in bean grinder on the top of the machine. Moreover, the grind settings can be customized as per your needs. The one-touch system offers users grinding beans and adding water to enjoy Americano. To make it even more value-for-money, the machine comes with double boilers that can heat the water for espresso and milk separately, effectively reducing the waiting time. The Breville BES980XL Oracle offers programmable pre-infusion which allow users to program the machine to soak the coffee a little before starting the extraction to provide better taste and flavor to the coffee. You can adjust the temperatures of water and milk, really giving you the flexibility for your brew. DeLonghi America ECAM28465B Prima Donna is an easy to use and clean machine. Similar to most automatics, this machine offers various features such as one-touch latte and a classic LED display panel. In addition, this machine comes with a memory feature to remember and consistently make your favorite blend. What’s great about this machine is the ability the make consistently thick froth. If you love cappuccinos or lattes, this might just sweetened the deal for you. With the 2 liters water tank, staff can pull many shots before you will need to re-fill it. All in all, Delonghi Prima Donna comes with everything you would expect. Nuova Simonelli Talento is the office use espresso machines that caters to large offices with many employees or guests. Its’ speed of 150 espressos per hour is designed to cater to large groups of coffee drinkers. This machine comes with two built-in grinders, operates independently so you can grind decaf and caffeinated beans (or really just 2 types of beans) both at the same time. In addition, grinding setting of these bean hoppers is customizable. It comes with two separate 2.5 liters boilers too. This allows you to boil water for espresso and steam milk simultaneously. Also, the machine comes with a pre-infusion system that allows users to program the machine to soak the coffee a little before starting the extraction and provide better taste and flavor. One of the selling features this machine offers is the faster processing. It can grind the beans and make a double shot of espresso in less than six seconds. The Gaggia Accademia espresso machine is one of the super automatic coffee machines, specifically designed to brew approximately 60 cups a day. The machine offers an intuitive operating system and extremely easy to operate. This machine comes with 15 bar performance pump and with double boiler facility. In addition, the machine has an adjustable ceramic grinder and allows up to 10 different grind settings. An LCD control panel easy to control and the program offers 7 pre-set drinks such as latte and cappuccino. The only aspect that we think it could be improved is the need to manually froth milk. I would prefer to have the machine do it automatically. Selecting a coffee machine for your workplace is a tough decision to make as there are so many different models available offering a tremendous amount of features. Without saying, the price is important but not the only factor, there are some other important features too that are equally important such as machine capacity, the convenience of use, design and customizable features in order to enjoy personalized espresso shots based on individuals’ preferences. Hopefully, we have provided all relevant and important information that you need to make that choice. So if you are still undecided and ask us which one we would choose. We would recommend the Breville BES980XL. This super automatic machine is a blend of value, convenience and aesthetics. Besides meeting our basic requirements above, the look of it would be pleasing to both staff and customers alike.